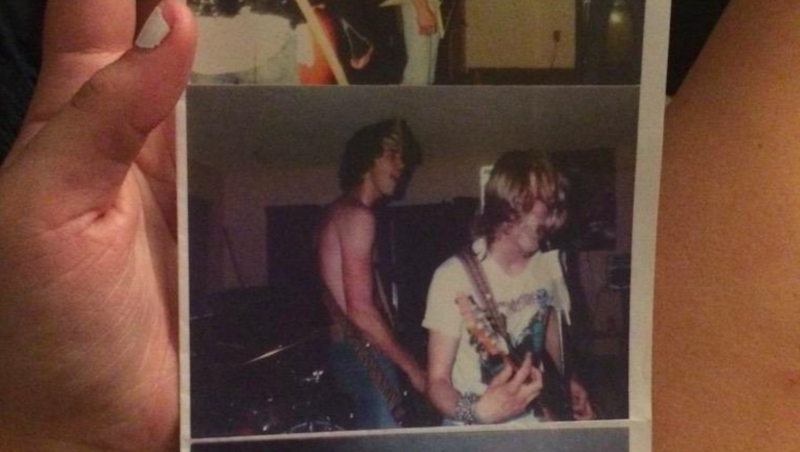 Nobody thought photos of Nirvana’s first show existed. Until a teen girl tweeted them. This smells like teen spirit—and looks like something we’ve never experienced before. Maggie Poukkula didn’t think twice when she tweeted the photo below of her father from 1987. Tony Poukkola was in a band called Laytem at the time and lived in a house with a few other musicians. The photo that 19-year-old Maggie shared shows Tony lending his guitar skills to a fledgling band that drove a half-hour to perform in his basement. That band was Nirvana. And it was their first-ever show. Maggie understood that having a dad who has played with Kurt Cobain and company was pretty darn cool. But she did not have a clue this was the first time these photos—hidden away in her father’s library for decades—had ever surfaced. For Kurt Cobain, that first performance was reportedly a disaster; he supposedly threw his guitar on the ground and walked out an hour into the show. Listen and decide for yourself whether the set was all that bad—and try not to think about how uncool your dad is in comparison to Maggie’s.